Is your Lockout/Tagout program worn out? Revamp your training now with our Train-The-Trainer PLUS workshop! Over the last couple of years, Lockout/Tagout has been one of the most cited standards in the U.S. Serious injuries and deaths can result from unexpected start-up of equipment if it's not consistently locked out properly. This half-day workshop provides a clear understanding of the standard, effective lockout techniques, and written program development, as well as how to conduct your own in-house training session. 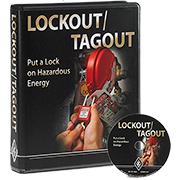 PLUS, you will receive J.J. Keller's Lockout/Tagout: Put a Lock on Hazardous Energy training program to bring back to your facility. Get both the training and the program for just the cost of the program! Bring your backup - additional employees from the same company can attend attend at a substantial discount, but will not receive the DVD program. Already offered this term; next scheduled offering to be announced.